In the early morning I passed by the window without my glasses on and spotted something colorful at the bird feeder. Something very colorful and unfamiliar, though hazy. I rushed to get my glasses: it was a new bird, and I guessed that it was a Grosbeak. I got the camera and the bird obliged, visiting for another ten minutes. When I sat down in the sofa with my bird book Amie immediately imitated me, getting her animal book, sitting down right next to me, and finding the animals she was spotting. It was incredibly sweet. 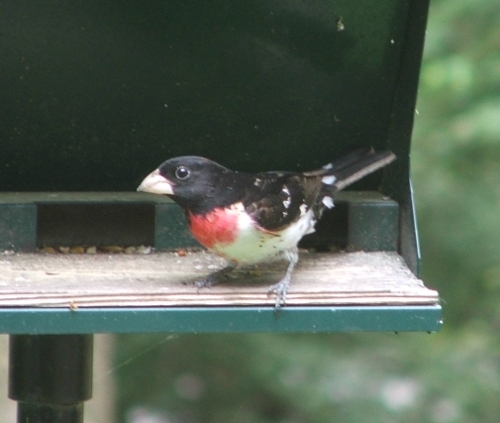 Turns out it was a Rose-breasted Grosbeak. It’s a summer resident. 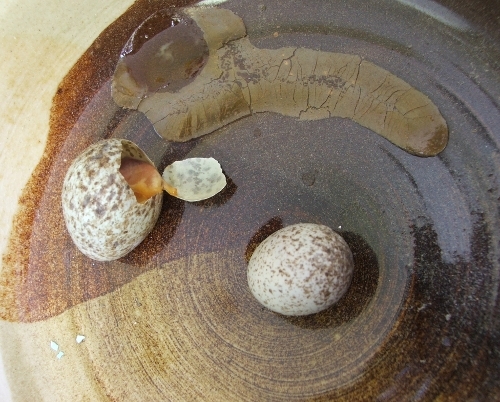 A week ago I also found some eggs in the garden where a tree was cut down. One was broken, the other two intact, which I took inside and put into one of my bowls, thinking I might find a way of preserving them. Then I flat forgot about them, until today, when I found one broken (or rather, burst) open: it had a half developed little chick inside. I threw them in the compost. Anyone know what birds these eggs belong to? 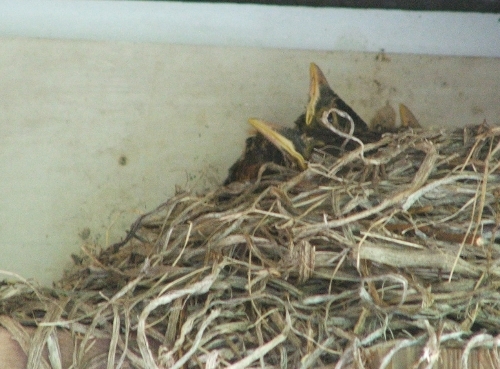 There were four little robins at first, and then there were only three. 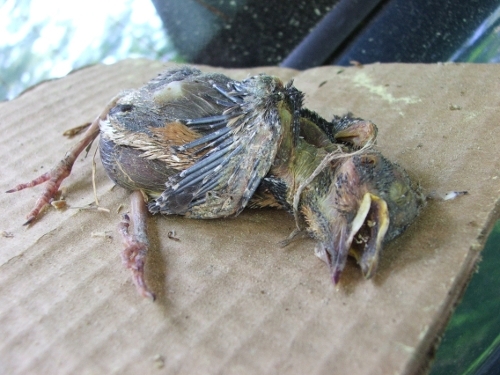 One fell out of the nest, it was lying dead on the pavement next to the car. I took pictures, of course – dead wild animals afford that rare close look – and then disposed of the body for some lucky fox or cat. It’s part of the great cycle of life, but how sad. It’s not that I chose not to tell Amie, it just didn’t come up. 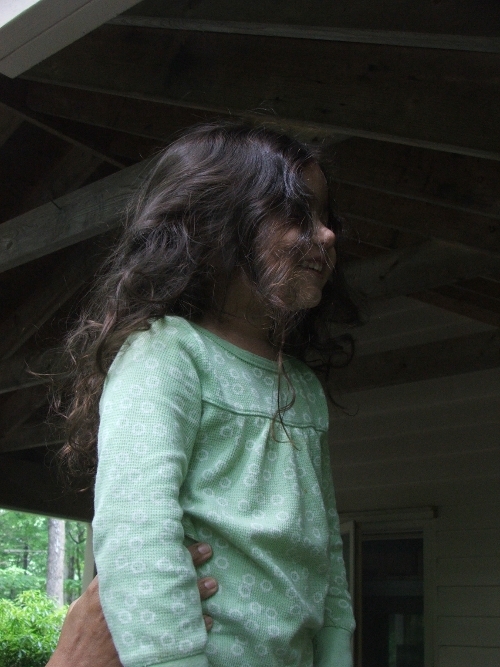 She climbed on the ladder to see the remaining three chicks and was wowed. Next year, if they choose to grace us with their presence again, I want to install a live webcam. I have been looking for a name for our tiny homestead. We’re on a hill and have lots of chipmunks, so I was thinking “Chipmunk Hill”, but in honor of our Robins we’ll call it Robin Hill – I like the Robin Hood connotation!